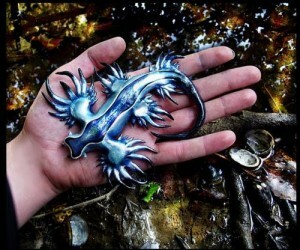 The Blue Dragon, or Blue Glaucus, is a sea slug that can grow up to about 3 centimeters long. It spends its life floating along just under the surface of the water, upside down. 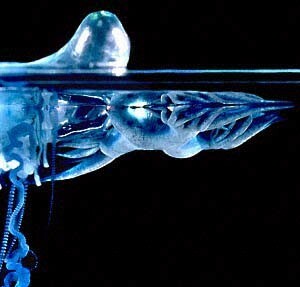 It carries an air bubble inside that allows it to stay near the surface of the water. The Dragon’s blue underside cannot be seen well from above, protecting it from hungry, fishing birds. Its topside is silvery gray, which cannot be seen well from under the water and this protects it from hungry fish. Some sea critters do manage to find this feisty delicacy and do try to eat it. They must get past its poison, however, for it protects itself well. 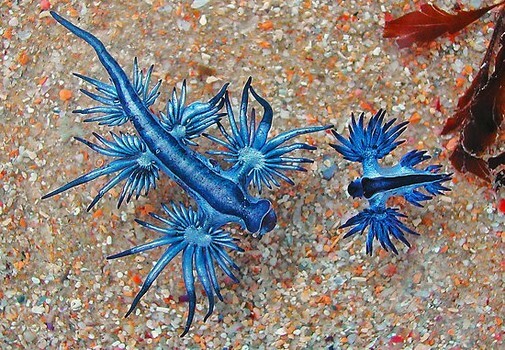 When a blue dragon manages to beat and eat a Portuguese Man-of-War, it has the unique ability to swallow the stinging cells, or nematocysts, without harming itself. On the contrary, it uses these stinging cells to defend itself in the wild blue yonder. admin on 63-Year Old Mama Has a New Chick!